Our design of a performance exhaust system for this popular new car took us back to our Musclecar roots. 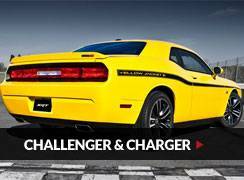 We wanted to get that great sound and some serious performance from these modern Musclecars. The 2.5" cat-back system we designed includes an X-pipe, a pair of Pypes mufflers and tailpipes with 3.5" Polished Stainless Steel Tips. All model years are available in both V8 and V6 configurations. Installation is simple and we include all the clamps, hangers, etc required to get the job done. We added a nice performance boost and killer sound to the stock exhaust by applying our Pypes’ touch to the components of this system. An X-Pipe and performance matched Race Pro Mufflers add the optimum amount of punch and tone to these systems. 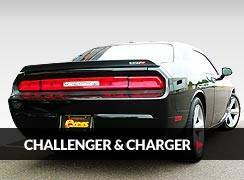 Search For More 2008-2014 Challenger Parts! Search For More 2006-2010 Charger Parts!